Algae has begun to collect along the shoreline on the northwest side of Overbrook City Lake. 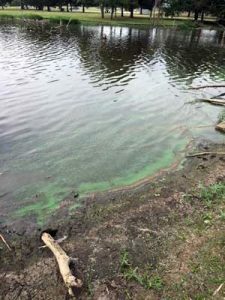 OVERBROOK, Kan. – Overbrook city officials have notified citizens that early signs of blue-green algae were discovered in the northwest corner of City Lake on Wednesday. According to the notification, Kansas Department of Health and Environment will be at the lake on Monday for testing. In the meantime, KDHE has recommended the lake be under watch status for this weekend, as there is a potential for a blue-green algae bloom. During an algae bloom watch, people are advised to keep livestock and pets away from the water; use caution when contacting lake water and wash with clean water afterward; avoid areas of algae accumulation; don’t let people or pets eat dried algae or drink untreated lake water; and clean fish well and discard guts. In case of harmful algae contact, it is advised to call a doctor or veterinarian if people or animals have nausea, vomiting, diarrhea, rash, irritated eyes, seizures, breathing problems or other unexplained illness. For more information about algae blooms in Kansas, contact KDHE at 785-296-1664, or see www.kdheks.gov/algae-illness/index.htm. For more information about algae conditions at Overbrook’s City Lake, contact Overbrook City Hall at 785-665-7328. Photo thanks to Overbrook City Hall.